Overview - When Jesse (Josh Radnor, 'Happythankyoumoreplease'), a 35-year-old New York college admissions adviser, is invited to his Midwestern alma mater to attend his favorite professor's retirement dinner, he quickly falls back in love with the university life. But when he meets 19-year-old student Zibby (Elizabeth Olsen, 'Martha Marcy May Marlene,' 'Peace, Love & Misunderstanding'), the bright, beautiful, book-loving daughter of his professor's friends, he suddenly finds himself caught in a moral dilemma: does he pursue a relationship with this kindred spirit, or does he break her heart and return to the "real world"? Sophomore directorial efforts can present quite a challenge for any budding filmmaker. Faced with the pressures of living up to (or in some cases, making up for) their cinematic debuts, some directors end up second guessing themselves, veering down misguided paths. Thankfully, Josh Radnor mostly bucks this trend, and instead of regressing or repeating himself, he actually demonstrates notable growth as an artist. Realizing some of the potential demonstrated in his disappointingly mediocre freshman outing, 'Happythankyoumoreplease,' 'Liberal Arts' offers a much more insightful and well-rounded experience. There are still some stumbles along the way, but the film marks a sizable improvement that's left me eager to see what Radnor has in store for future efforts. The script focuses on Jesse (Josh Radnor), a slightly disillusioned 35-year-old obsessed with literature and stuck in an emotional rut. When his former college professor (Richard Jenkins) invites him to a retirement dinner, Jesse jumps at the opportunity to visit his alma mater. Overcome with rose-colored nostalgia, the former student decides to linger around the idyllic campus, and soon befriends a spirited and intelligent 19-year-old co-ed named Zibby (Elizabeth Olsen). Despite their 16-year age difference, the two form an instant connection. Torn between conflicting emotions, Jesse attempts to sort out his romantic life and existential issues, hoping to find some semblance of happiness. Early on in the runtime, Elizabeth Olsen's character articulates a simple parallel between the art of improv, and the unscripted realities of everyday existence. Admittedly, it's not the most inspired metaphor, but it does ring true -- and it perfectly sets the tone for the many straightforward yet still perceptive observations to follow. Through his characters' inner and external struggles, Radnor offers a thoughtful rumination on a wide range of weighty topics. The dialogue heavy presentation delves into the hardships of love, aging, and loneliness, while also stirring up fairly engaging debates about elitism, morality, and the burden of intelligence. Not all of these conversations and insights prove to be as enlightening as intended, but there is a frank sincerity and openness in the writing that is refreshing. Likewise, despite the numerous philosophical musings, the filmmakers avoid turning the characters into simple mouthpieces, and instead, the thematic material always serves their personal journeys. Jesse and Zibby's romantic developments rest at the center of the narrative, and Elizabeth Olsen and Josh Radnor share believable chemistry. Olsen, in particular, has an effortless, natural quality to her performance that seems to belie her young age. Precocious, free-spirited, and remarkably mature, Zibby serves as a great counterpoint to Jesse's decidedly stunted persona. For the most part, Radnor is his usual likeable, goofy self, and the actor seems right at home in the character's idealistic, shamelessly romantic shoes. With that said, Jesse is more than just a standard "nice guy." In fact, the book-obsessed character can be a bit of an art snob, and this elitist quality helps to add some flawed layers to the part. Though there's a 16-year age gap between the two characters, their individual maturity levels essentially split the difference -- making their coupling seem more like a pair of evenly matched 27-year olds in love. Still, their union presents some hefty challenges and moral dilemmas, and the filmmakers actually take the duo through a few atypical turns -- resulting in solid drama and a few amusing laughs. Despite the film's emphasis on relationship woes, Radnor's goals extend beyond romantic conflict, taking a broader look at Jesse's imperfect life. Several subplots dealing with secondary characters -- including a genius college student who suffers from severe depression, and an aging professor who undergoes post-retirement remorse -- also help to elaborate on the movie's larger themes. An overarching longing for happiness permeates throughout the age-spanning ensemble, and their paralleling conflicts all serve to illuminate the longstanding myth of so-called "adulthood." The young characters reveal old souls, the old characters reveal a yearning for youth, and Jesse just sort of meanders somewhere caught in the middle, seemingly unsure what to do -- or even what to feel. Expanding upon the simple but effective aesthetic found in his previous effort, Radnor presents a slightly more refined style. Most scenes simply let the story speak for itself, but there are a few overt visual flourishes peppered throughout. A montage sequence chronicling Jesse and Zibby's back and forth mail correspondence (yes, the two characters actually hand write letters to each other) is particularly noteworthy, and the director creates an appropriately dreamy atmosphere through the sequence's use of voice-over, roaming shots, cross-cutting, dissolves, and classical music. While Radnor's choices are all mostly effective, his inexperience does shine through on occasion, with a few obvious and superfluous camera movements (including an early, unnecessary 360 shot). Other shortcomings creep into the scripting as well, slightly diminishing the film's overall impact. A certain cheesiness finds its way into some scenarios, lines of dialogue, and performance choices (Jesse's initial, wide-eyed return to the campus is a bit much). On that same note, some of the film's emotional ruminations are far too on the nose and borderline trite. A recurring tangent involving a wise young hippie (surprisingly well played by Zac Efron) is amusing, but the character and his upbeat insights are quite clichéd. The aforementioned depressed student storyline goes down a very familiar path as well, and there's an occasional disconnect between the various thematic subplots and the main narrative. Radnor has a lot to say here, and while the sentiments are all strong, the executions isn't as polished and sophisticated as it could be. With his second feature length effort, Josh Radnor successfully avoids the dreaded sophomore slump. There are some issues here and there, but the movie offers a sweet, funny, and occasionally thought-provoking experience. As Jesse struggles through a series of personal epiphanies and romantic setbacks, the film weaves an unashamedly sensitive examination of happiness, aging, and the precarious relationship between art and life. In contrast to those found in his mediocre debut, the characters in 'Liberal Arts' actually have something interesting to say, and there are a few genuinely thoughtful observations. Radnor still has to work out some notable kinks in his storytelling and directing methods, but the core of the movie is heartfelt and perceptive. MPI brings 'Liberal Arts' to Blu-ray on a BD-25 disc housed in a keepcase. After some skippable trailers, the disc transitions to a standard menu. The packaging indicates that the release is region A coded. The movie is provided with a 1080p/AVC MPEG-4 transfer in the 2.35:1 aspect ratio. Shot on the Red Epic, the video has a sharp, detailed look with pleasing saturation. The digital source is mostly clean and artifact free, but some moderate noise does creep into a few scenes. The image carries a great sense of clarity and dimension, rendering facial features, background textures, and the silly patterns on Richard Jenkins' shirts with impressive fine detail. Colors mostly stick to a cool palette, and there is some decent pop, especially in the lush greens featured in outdoor sequences. Contrast is often high with bright whites that can appear a bit overexposed. Black levels are mostly deep and steady. The only real drawback to the image, involves some minor inconsistencies with the cinematography's aesthetic from scene to scene (mostly with lighting, color, and contrast), but the technical presentation is sound. 'Liberal Arts' comes to Blu-ray with a very nice video transfer. The style is a bit erratic (perhaps revealing some budgetary issues), but the image is frequently impressive. The film is provided with an English DTS-HD MA 5.1 track. Optional English SDH and Spanish subtitles are also available. Crisp and quietly immersive, this is an effective but unassuming mix. Speech is clear, precise, and well balanced throughout. The soundstage is comparatively modest, but the New York scenes feature appropriate city effects, sending traffic and background chatter to the surrounds. Sequences set in the protagonist's idyllic college, emphasize a gentle nature atmosphere, adding a subtle sense of immersion through chirping birds and swaying trees. Directionality and imaging are natural but minimal, and the track maintains a delicate sense of space and ambiance. The score mostly consists of classical music selections, and these pieces boom from the speakers with strong fidelity and range. It's not the most lively mix, but the film's audio does a very nice job of complementing the story. Any more activity would have likely only overpowered the content. Commentary - Writer/director/star Josh Radnor and producer Jesse Hara sit down together for this commentary track. They spend most of the time elaborating on character inspirations, shooting locations, themes, production trivia, and cut material. Family cameos are also pointed out, and Radnor candidly admits that he's still learning and evolving as a filmmaker. Unfortunately, most of the insights and stories offered aren't terribly interesting. While not the most stimulating track, big fans may still want to take a listen. Deleted Scenes (SD, 17 min) - Eight deleted scenes are viewable together with chapter breaks. There's a bit more between Radnor and Olsen, and an interesting shared coda for Richard Jenkins and Allison Janney's characters, but the majority of the material here focuses on an excised subplot involving one of Jesse's friend's plans to move to Spain. While there's some merit in all of these cut sequences, they're pretty unnecessary and were wisely removed. Featurette (HD, 2 min) - Presented in 1080p, this supposed featurette is really nothing more than a glorified trailer with a few fleeting interview snippets added in. 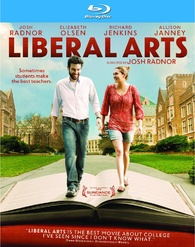 After my rather lukewarm reaction to Josh Radnor's mediocre debut, I honestly didn't know what to expect from 'Liberal Arts.' Thankfully, the writer/director shows a solid improvement in his storytelling skills. While still flawed, the film's sensitive and perceptive observations mostly ring true, resulting in an entertaining and occasionally thoughtful experience. The video transfer and audio mix are both very good and essentially problem free. The supplements are decent but not terribly enlightening. It can be a bit clunky and obvious, but those looking for an introspective romantic dramedy should definitely give this a shot.